Highly contrived thriller about a top-secret race to save the life of the president’s daughter. President Jonathan Andreas has asked Dr. Jessica Riley, a somewhat unorthodox psychotherapist, to take seven-year-old Cassie to her secluded Virginia farm, with the hope that there Jessica can cure his severely traumatized daughter. Cassie has withdrawn after witnessing masked assailants murder her beloved French nanny while her parents were away in Paris. Catatonic except for periods of incoherent screaming, Cassie is unreachable. No one knows that the killers were after the Wind Dancer, a golden statue of Pegasus, previously owned by the likes of Alexander the Great, Charlemagne, and the Borgias, and now in the possession of the Andreas family. But the intruders didn’t get the statue. It was on loan to a Paris museum, and all they saw was its shimmering image—in a hologram. Jessica suspects that seeing the real thing again might bring Cassie back, but Jessica’s younger sister Melissa disagrees. Melissa herself recovered from six catatonic years after seeing her parents burn alive in a car wreck, and now, as a result of her sojourn in that twilight world, she is telepathic and can hold psychic conversations with others of her ilk. Her mind-melding with Cassie, however, is to no avail. The sisters meet Michael Travis, a shadowy international operative who witnessed his father’s death in an explosion years ago and is similarly gifted. Impatient for results, Jessica kidnaps Cassie and takes her to Paris to see the Wind Dancer. Not surprisingly, the good doctor is set upon by mysterious assailants. Meanwhile, there are plenty of bad guys in silly disguises skulking around, but when the real villain emerges, Michael and Melissa will manage to foil him—and fall in love. 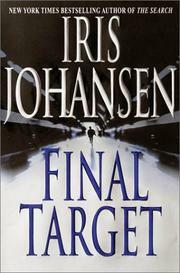 Johansen’s seventh kitsch thriller (The Killing Game , 1999, etc. ), complete with a cartoon president who seems to live in France. Supernatural special effects don’t even half-plug the holes here.